When you absolutely need your cigars to get there in one piece, no matter what. The X-treme series of cases are the toughest and roughest cases out there and are up to any challenge. Made from high impact plastic with an absolutely air and watertight seal, humidifier, foam cigar-shaped inserts and lock loop, its hard to imagine any situation where these cases would not fit the bill. A favorite of our military customers! I recieved this Humidor in a timel fashion, well packaged, and put it right to use. It works perfectly even in the dry of the Middle East desert. A must have for any traveling cigar smoker ruff, tough, and reliable. Great travel case for the price. Took down a bunch of RyJ Habana Reserve Love Stories to the Outer Banks. Was able to fit 21 cigars in there. Case kept the cigars protected even out on the beach. Bestcigarprices Travel Cigar Protection Case #15 is rated 5 out of 5 based on 6 customer ratings. How long does it stayed humidified? 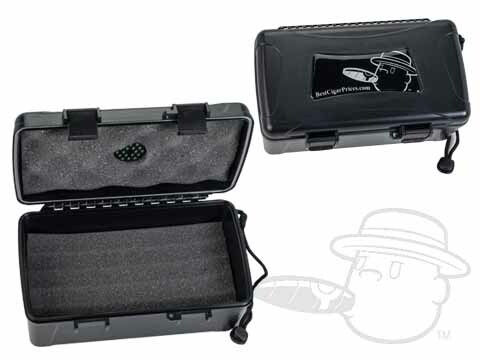 The BestCigarPrices Travel Cigar Protection Case has a humidifier that is re-chargeable with PG Potion or distilled water. This case will last a lifetime!! How do you humidify the case? Each case comes with a mini humidification device that you can charge with our PG potion! There is a humidifier in each case that you can add PG Potion to. This will humidify all the cigars you're holding in the case. What are the outside dimensions of the case? The BCP X-Treme Protection case measures approximately 4" tall, 5" wide and 8.5" long.